Navigate securely and confidently - wherever you go! 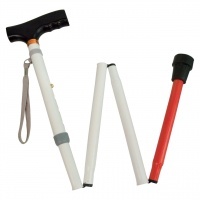 This versatile Reizen Adjustable Folding Support Cane for the Blind allows you to maintain your active lifestyle with the assurance that, as you go about your busy business and social life, you'll be able to get around safely. This sturdy aluminum support cane helps you maintain balance as you walk, increasing the range of your mobility and providing the peace of mind knowing it's there for you to lean on when you need supportive assistance. Plus, with the traditional coloring of a cane for the blind (a reflective red lower section and bright white upper sections) you'll be more visible to those around you, giving you and added level of safety and security. - Product Weight: 12.4 oz. - Weight Capacity: 250 lbs.